This is a brief tutorial showing a simple and fast way to use Clone Tools to find duplicate files and delete the ones you do not want to keep. The first step is to use Clone Tools to find duplicate files. Click the "New Clone Scan" button. 1: Select the folder you want to scan. 2: Click the "Add" button. 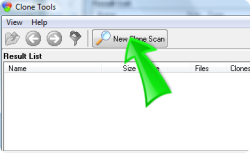 3: Click the " Start Scan" button and wait for the scan to finish. 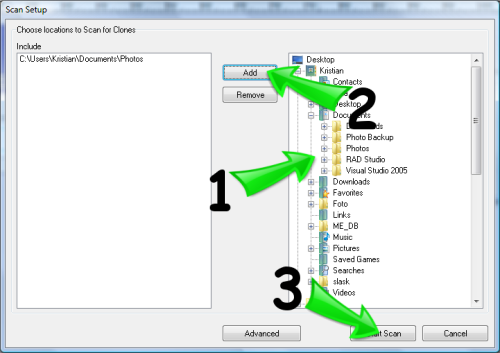 The second step is to use Clone Tools to delete duplicate files. Repeat this procedure for all folders that you want to clean from duplicate content. 1: Select a folder in the result list that contains duplicate files that you do not want to delete. 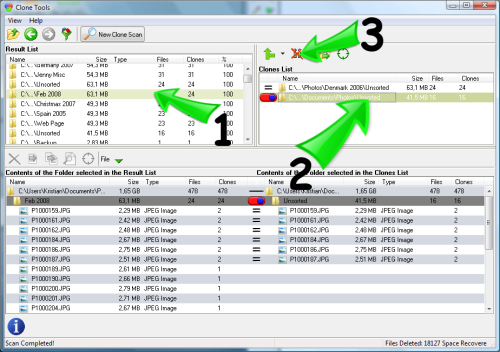 2: Select a folder in the clones list. All files in the folder selected in the clones list that has a duplicate in the folder selected in the result list will be deleted automatically. This is all you need to know to start cleaning your computer from unwanted duplicate files. But since Clone Tools is an extensive program packed with tools to help you find and delete duplicate files there is of course a lot more to learn. To find out more you may want to download the free trial version or keep reading at our site about how Clone Tools helps you to find duplicate files.